hyper-blasting Italian grindcore formed on the ashes of one of the few gore-grind acts Italy ever had in the '90s: THANATOLOGIST. 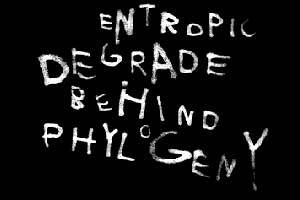 ENTROPIC DEGRADE BEHIND PHYLOGENY's attempt is to mix early grindcore rawness (above all the first 2 Napalm Death albums) with some even more cacophonic influences (ARSEDESTROYER, GORE BEYOND NECROPSY). They can be easily rated as Italy's most uncontaminated and radical old school grindcore with zero slowdowns or tempo changes, just straightforward blasting from start to end! EDBP are based in Liguria, a region of Northern Italy. The band saw its birth in 1999 after the break-up of THANATOLOGIST. In 2003 they recorded 14 tracks for a split CD with THANATOLOGIST (feat. their never released 1996 Ep) coming out in spring 2008 on Italy's Punk/Grindcore label E.U. '91 Serbianleague run by the CRIPPLE BASTARDS' singer. EDBP members are also playing in ARCHETYPE OF NOTHING (grindcore, split 7" with REPULSIONE out since a couple years) and SPLINTER VS STALIN (harsh noise). They have mainly played live around in Italy in the last years.